In one of the most dramatic races in recent history Lewis Hamilton holds off his team mate Nico Rosberg to win in Bahrain. I have been watching Grand Prix since the 70`s. Have seen many great races, this was up there with them all! 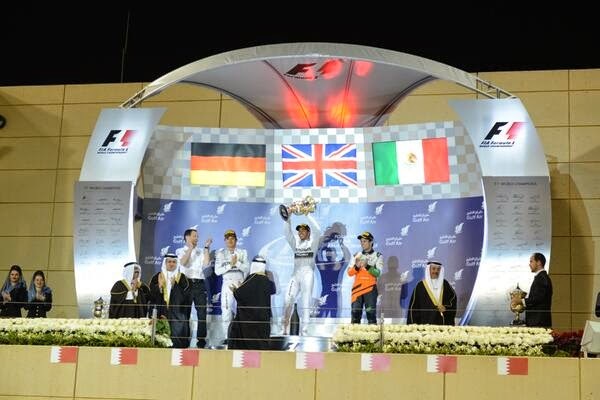 Bahrain 2014 will go down as a classic, why? Read on! 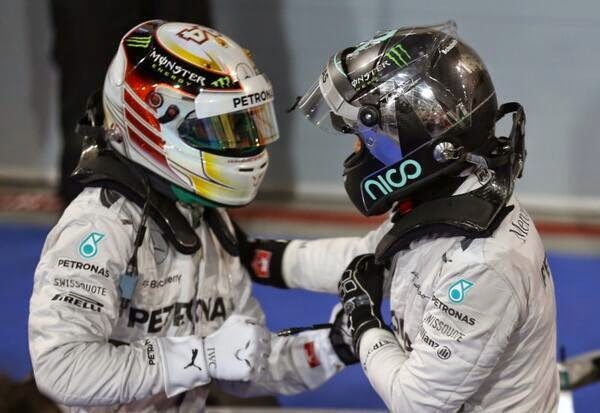 In qualifying Lewis made two rare mistakes during Q3 to give up pole position to his team mate Nico. This was instantly overcome at the start as Hamilton got the better getaway and pushed his Silver Arrow into P1 by turn 1. The early laps saw much jostling for position down the race order and the Force India drivers make an immediate impact by getting into the top 7 by lap 6. Meanwhile at Ferrari Fernando Alonso complains of low power as Nico Hulkenberg breezes past! Alonso and Raikkonen then find themselves together in 8th and 9th respectively. At the front Nico Rosberg keeps up with Lewis just 1 second behind. By lap 18, Rosberg closes the gap to Lewis to half a second and pushes hard. Nico tries a move on Lewis down the pit straight which Lewis reads and defends well. Hearts in the mouths for the Mercedes team on the pit wall! Lap 19 and Nico forces his way past Lewis and makes the move stick.Wait.. Lewis is a fighter and comes back at Nico re passing him and retakes the lead!! Lewis then pits for a fresh set of primes and the gauntlet is thrown down to Nico. During the mid part of the race Lewis manages to build a lead of nearly 7 seconds on his team mate. The Red Bulls battle the Ferrari`s for 9th and 10th and we are treated to many overtakes and inter team battles all down the field. I cant think of another GP with so much action! Lap 41 sees a major incident as Pastor Maldonado comes out of the pits and broadsides Esteban Gutierrez sending the Mexican airborne and barrel rolling. 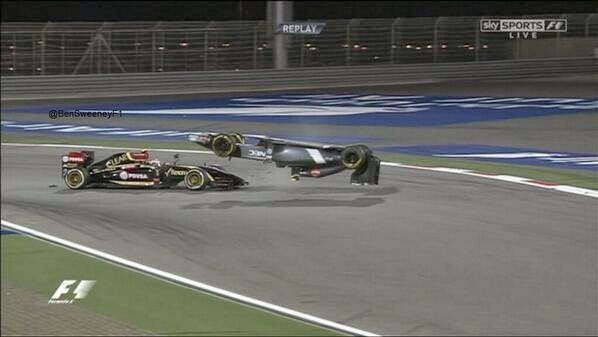 Luckily he is unhurt but surely Maldonado should get a race ban for that! Maybe pay drivers should be excluded from F1?! Cue the safety car much to lewis`s annoyance as he sees his near 10 second lead wiped out as both Mercedes drivers pit for fresh rubber. Nico has the advantage now as he is fitted with the faster option tyres and Lewis has another set of primes to finish with. At the restart Nico pushes Lewis hard into the final 8 laps.Lewis sets a fastest lap in an effort to put Nico far enough behind in order for Nico to not be able to use DRS. Lewis radio`s that he has "no power" but then improves his lap time to Nico by 2 tenths! Its getting tense now. During the closing laps we are treated to some of the best racing between two team mates ever! Time and time again Nico attacks Lewis and Lewis defends brilliantly! Meanwhile Daniel Ricciardo makes a stunning move to overtake Sebastian Vettel for 6th and makes a big statement! Last lap and Lewis Hamilton manages to stave off his faster team mate to take the chequered flag! Amazing win for Lewis in a race he had to win to take the championship to Nico. Great battles and overtakes between rivals all the way down the order. Great racing, great race! Fantastic race today! Looks like a great battle between team mates and rivals since their Karting days for this years F1 championship! Lewis Hamilton held off his Mercedes' teammate Nico Rosberg to win back-to-back Grand Prix in Bahrain as the team soared.